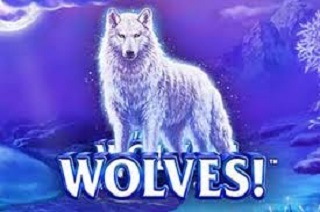 Wolves Wolves Wolves is a Video slot created by Playtech and has a pretty strong Native American theme. The slot offers play across 5 reels and between 40 and 100 paylines and playable on all electronic device. The game has a mystical feel and set against snow-capped woodlands with tepees, tomahawks, falcons and horses. There’s also a wolf symbol which appears in stacks 2 to 5 high on the reels. There’s a totem wild which substitutes for all symbols. Most importantly it is a rewarding symbol giving you 75 times your stake for 5 across a payline. There is 1 bonus feature – the Mystic Totem feature which in itself has some winning combinations to offer. The feature is triggered randomly on any base game spin and takes place over 1 to 3 spins. The reels can grow up to 9 rows high on any spin with each new row giving you 10 additional paylines. In other words, if the reels grow up to 9 rows high, you will ultimately be playing 100 paylines in total. When activated, this feature also gets expanding wilds which land in random positions. With enough expanding wilds taking over reels, you could have up to 100 active lines formed. This entry was posted in Casino Games and tagged PLay Wolves Wolves Wolves at Omni Online Casino, Wolves Wolves Online Slot with Omni Casino, Wolves Wolves Wolves Slot Review on October 17, 2018 by Casino Admin.